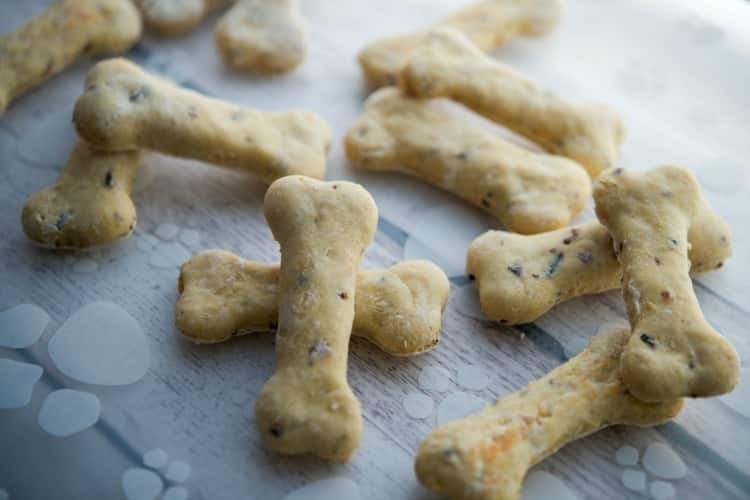 Dogs are part of the family too, so why not treat them to these special homemade Chicken & Wild Rice Dog Biscuits. Today is Take Your Dog to Work Day and since I’ve never experimented with making my own dog biscuits before, today seemed like as good a day as any to try my hand at these Chicken & Wild Rice Biscuits; especially since my two dogs come to work with me every day. We have two Shih Tzu’s, Tebow (age 3 1/2) and Koda (8 months). Tebow loves when I experiment with new recipes during the week and follows me everywhere. The kitchen; where all of the cooking takes place, the living room; where I photograph my food in the large bay window as it has the best natural light in the house. He likes to just sit and watch and then into the dining room; where I have my sudo-office. He likes to hop up on the chair next to me to keep me company while I’m editing photos and writing posts like these. Koda is still too little yet, so he just follows Tebow around everywhere he goes and is still trying to learn the ropes. I almost trip over him 10 times a day as he likes to be in the middle of all of the action. 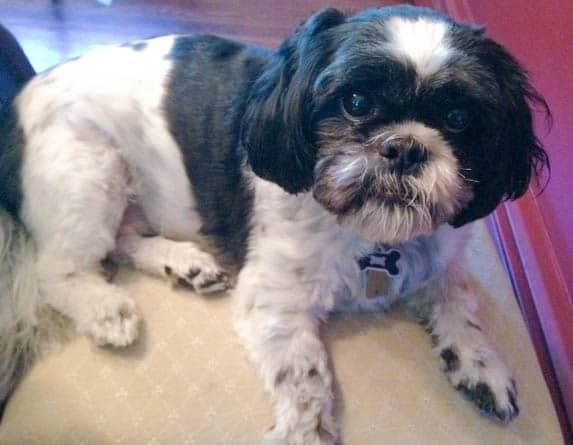 Growing up I only had one dog when I was about 4 or 5 years old; then my next dog wasn’t until we had Casey; a Llaso Apso who passed away last Fall at the age of 12. One thing I’ve learned since then is that dogs are truly part of your family and since I like to create family friendly meals, I thought it was about time I made something special for our four legged “children”. I decided to go with these Chicken & Wild Rice Biscuits since the food they eat is also chicken and wild rice. I didn’t want to give them ingredients they were unfamiliar with; especially the puppy. 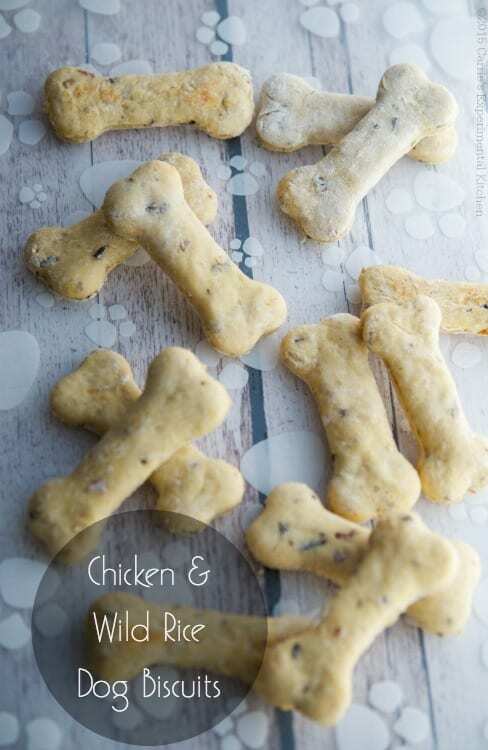 These Chicken & Wild Rice Dog Biscuits were so easy to make and are prepared with natural ingredients like chicken, wild rice, flour, salt, chicken broth and eggs. Start off by boiling a piece of boneless chicken breast and making wild rice; then allowed them to cool. You can do this a day ahead and keep refrigerated until ready to use. Add flour, salt, egg and pureed chicken and rice to a bowl and mix well; then roll out the dough on a lightly floured board until 1/2-inch thick. I purchased these dog bone cookie cutters from Amazon for about $5 (set of 3), but you can use any cookie cutter or glass to cut out the biscuits. Once you cut out the shapes, bake for about 30 minutes; then allow to harden. You can store these in an airtight container in the freezer for up to 6 months (allow 10-20 minutes for them to defrost before serving). My dogs L.O.V.E.D. 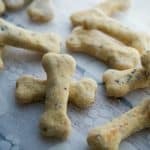 these dog biscuits and I like how easy they were to make at home; not to mention they contain ingredients that you can pronounce. This batch made 32 bones and I usedthe 3.5″ bone cutter, but will probably use a smaller size next time as they were a little big for my two little “boys”. 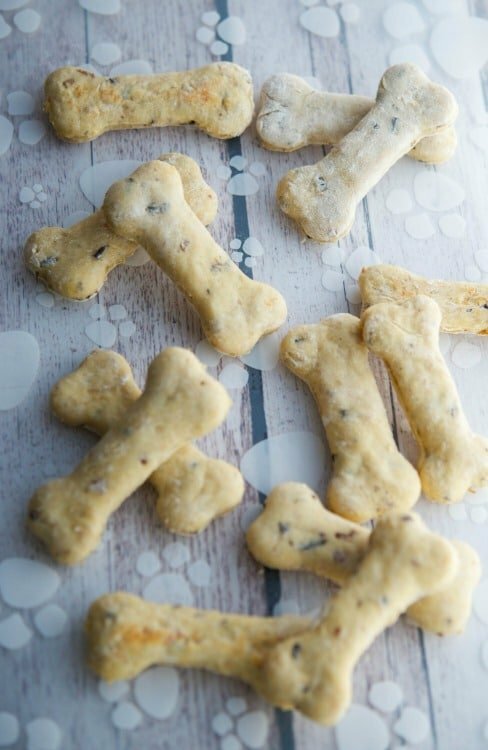 I hope your furry friends like these Chicken & Wild Rice Dog Biscuits as much as ours did. ~Enjoy! Combine chicken, rice and chicken stock in a mini food processor or blender and pulse until a paste forms. Add the flour, salt, egg and chicken paste into a bowl and mix well. Sprinkle a little flour on a flat surface and knead dough until it's no longer sticky; then roll it out with a rolling pin about 1/2-inch thick. Cut out shapes and place them on a parchment paper lined baking sheet. Mine yielded 32 biscuits using a 3.5" cookie cutter. Bake for 25-30 minutes until light brown. Remove from oven and allow to cool completely before serving. Keep these biscuits in an airtight container for up to one week. These biscuits can be stored in an airtight container in the freezer for up to 6 months. Allow to defrost completely (10-20 minutes) before serving. As we all know, our pets like to get into anything and everything we could possibly drop on the floor. Chocolate and Cocoa-The darker the chocolate, the more dangerous. Xylitol (sugar free gum, sugar substitutes)-Can cause liver damage and drop in blood pressure. There are many foods that are acceptable for dogs to consume. Here are some healthy foods to feed your pets. Tebow is a popcorn fiend. I usually pop mine on top of the stove and as soon as he hears the jar of kernels, he comes running! For more details, visit PetMedicine.com. 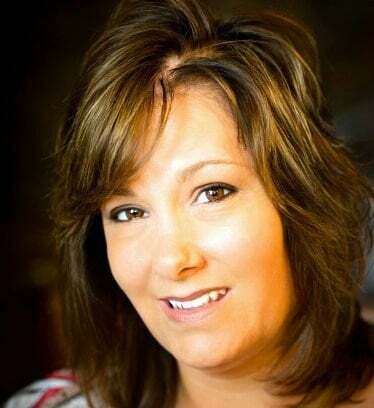 *This post includes links to my affiliate account at Amazon.com where Carrie’s Experimental Kitchen earns a few cents on the dollar when readers like yourself purchase the items I recommend. Thank you for supporting Carrie’s Experimental Kitchen when you shop at Amazon! I wood like to try it for my grandson dog and See if she likes the or not if you have more ill like to try them to thank you…??? These sound great but after they are baked do they need to be refrigerated? I used coconut flour and added peanut butter (since the coconut flour made it a bit too dry) and they’re cooking now! I let my pups have some of the dough and they went CRAZY. Thanks for the great recipe! When I put the recipe into My Fitness Pal, it gives me this information: Total Fat 0g, Saturated Fat 0g, Polyunsaturated Fat 0g, Transfat 0g. I hope this helps! are these ok for a 6 mos. puppy? There is nothing in it that should harm the dog as it’s all natural ingredients, but I would double check with your veterinarian first to make sure since puppy diets can be more limiting depending on the breed. I will certainly try this recipe for my shih tzu Mopsey. She is 8 yrs.old and looks just like your puppy. Awe, I hope Mopsey enjoys the treats! What temp do you bake the treats? Would you have a good recommendation besides chicken in this recipe? My little gal is allergic to chicken. I’m sure you could use any other protein in it’s place (beef, seafood, etc) though the consistency may change. I haven’t tried it personally with anything other than chicken.